Maximum size: 6 cm / 2.5 inches. A tank of at least 20 gallons is preferred because of their size. They will stay at the top to medium level in your aquarium. So the bigger surface area the better. Origin: The Amazon River Basin, the Guianas and Venezuela. Company: The Silver Hatchetfish (Gasteropelecus Sternicla) is suitable for community aquariums with other peaceful species. 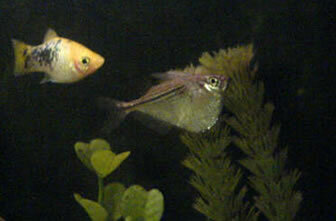 They are also schooling fish and will be much happier in a group of 6 or more. The large group will keep them less stressed, therefore less likely to get a disease. Sexing: Not easy, females slightly plumper. Breeding: Never been recorded in captivity. Feeding: From the way the mouth if positioned you can that this fish feeds from the surface therefore floating food is needed. They will eat flakes and also like small insects such as fruit flies and mosquito larvae. Description: Gasteropelecus Sternicla are a more unusual freshwater fish, Much resembling a hatchet (axe) they have thin deep bodies, upturned mouths and high pectoral fins. This fish is the only true ‘flying fish’ in the wild Gasteropelecus Sternicla will leap into the air moving their pectoral fins to help them ‘fly’ and to catch flying insects to eat. Of course this means they are exceptional jumpers, have a tightly fitted with no gaps on your aquariums hood!